That seems odd, given that most movie fans would make the obvious connection between “Vertigo” and “Phoenix.” Both films are about women who remake themselves for men, recreating the haunting spectre of a flame thought lost forever. Maybe the connection is so obvious that it’s not worth mentioning. Or maybe “Phoenix” goes so deeply into its own distinct themes — of betrayal and identity, of the futility of trying to change back into the person you were — that the cinematic homage becomes the least interesting part of the film to those who made it. 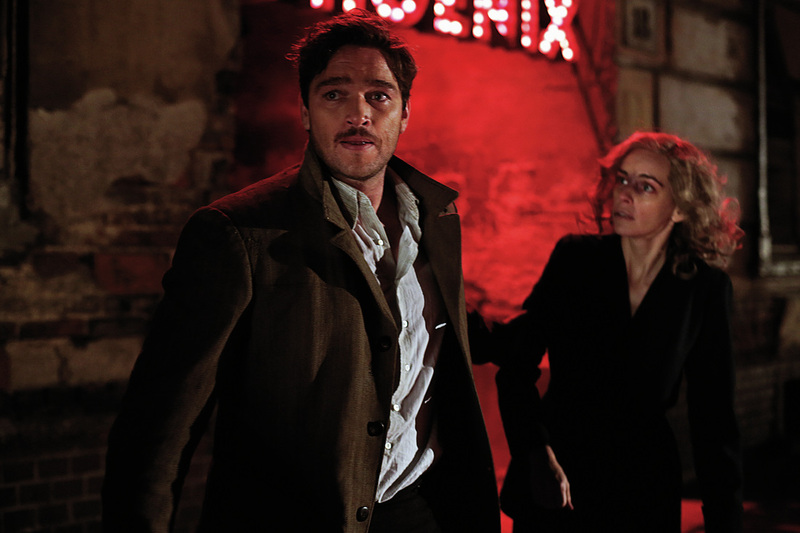 Jewish singer Nelly (Nina Hoss, in her sixth collaboration with Petzold) was taken to the concentration camps in 1944, Nelly somehow managed to survive, although a bullet to the face disfigured her. As the film opens, she is being taken back home to Berlin by her friend Lene (Nina Kunzendorf), who wants Jews to leave the Germany who betrayed them and start over in Palestine. But Nelly wants to resume her old life — it’s telling that the surgeon who reconstructs her face calls the process “re-creation.” But, just like the new face Nelly wears that makes her unrecognizable, everything in Berlin has changed. Her old home is now rubble. Many of those she knew have died, and those that survived have to answer for why. Nelly carries a photo with her of old friends; the dead have circles drawn on their faces, the Nazi collaborators have crosses. No one’s face is unmarked. Nelly finds her husband Johnny (Ronald Zehrfeld) busing tables in the tawdry nightclub that gives the movie its title. We learn that Johnny was arrested by the Nazis two days before Nelly, yet he was released. Why? It’s a question the shattered Nelly prefers not to face. Johnny thinks Nelly died in the camps, and doesn’t recognize the “re-created” Nelly. But in a clever twist of the knife in Petzold’s screenplay, he thinks she looks enough like her late wife to concoct a scheme. She will “impersonate” Nelly so that he can get access to her inheritance. So, in a basement apartment, Johnny teaches Nelly how to look and behave like Nelly in scenes that are a grotesque marriage of “My Fair Lady” and “Frankenstein.” Nelly acquiesces, emotionally hungry both for Johnny and to be the Nelly she once was. But it’s not so easy. Nelly’s needy desire to turn back the clock and pretend the Shoah never happened perhaps reflects Germany’s own desperate need to forget — as we learned in the (much lesser) German melodrama “Labyrinth of Lies,” war criminals walked around unmolested for years because of the country’s initial refusal to face its complicity. But “Phoenix” is ultimately not a political story, but a personal one, about how trauma changes you and you can’t change back, ever. While I would have loved a commentary track on the Criterion Collection edition, the interviews included on the disc are illuminating and specific. The side-by-side interview with Petzold and Hoss is especially fascinating, as Hoss sees her role as something of an interpreter of Petzold’s themes and obsessions. But Hoss reflects those themes back in an “infinite variety” that Petzold doesn’t expect. Her performances surprise and challenge him; he talks about her taking his ideas and “going off into the darkroom” to create something he never expected. For her part, Hoss said the nature of her character meant that she had to keep herself closed off from Petzold during shooting. Petzold said he found himself identifying, uncomfortably, with Johnny, trying to sculpt Nelly into something that she wasn’t. But he protests too much: “Phoenix” is a fascinating collaboration between one of the most intriguing actor-director pairings in movies today, an act of pure invention whose process can’t be fully understood by either contributor.